Peace Pilgrim Graeme Dunstan will appear in the Rockhampton court today (Tuesday August 20) for the second day of the Tiger Ploughshare Trial. Graeme Dunstan (71), of Peacebus.com, is defending himself against charges of wilful damage to Commonwealth property, for his role in supporting the Tiger Ploughshare action which took place during joint US –Australia military exercise, Talisman Saber 2011. 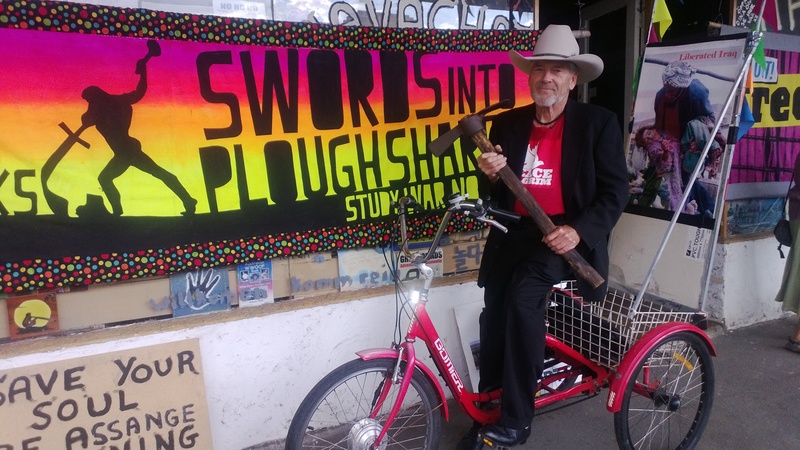 In June 2011, Bryan Law rode a large red tricycle across the Rockhampton airport tarmac and disabled an Australian Army “Tiger” Armed Reconnaissance Helicopter in a creative act of disarmament, with a blow from a garden mattock. His intention was to enact the biblical prophecy of “Beating Swords in to Ploughshares” meaning taking action to convert killing machines such as the Tiger helicopter – into ploughshares – tools for farming and growing life. Mr Dunstan’s hearing started on Monday, with jury selection, which was followed by the testimony of three witnesses from the prosecution case. Tuesday former human shield from the Iraq war, Donna Mulhearn, will join the defendant in Rockhampton. The prosecution will continue their case on day two of the Tiger Ploughshare Trial. Former human shield activist Donna Mulhearn will arrive in Rockhampton (Tuesday) to support Mr Dunstan and his friends in the trial. Ms Mulhearn went to Iraq in February 2003 in an attempt to afford some protection to the civilian population due to her foreign status. Ms Mulhearn has since been numerous times to Iraq, where she has met with families who continue to be impacted by the US invasion. Mr Dunstan is representing himself in court which is expected to go for two or three days.